How can this game be used? Anyone mature enough to play. We all live lives filled with hopes, dreams, and values but inevitably struggle with difficult thoughts and feelings that often hold us back from pursuing what is most important to us. This game addresses that dilemma using the principles of Acceptance and Commitment Therapy. 1-6 players. You can play by yourself or with others. You can play for any amount of time that you wish; you do not need to reach the final square to have a valuable experience. In terms of start to the final square, it depends on how many players are playing. Filling out player profiles is about 5 minutes. Each player gets an average of 7 turns. A turn takes about 2.5 minutes in total. The time can vary depending on the luck of the dice and other factors. There is no need to rush through a game. You can pause the game at any time and continue the next time you play. Another option is to agree to play a specific amount of turns each or for a specific amount of time and then see who is farthest along at the end. For a game that takes half the time, you can multiply all dice rolls by 2. I ran out of player profiles. Can I get more? Yes. If you can, make photocopies of a blank player profile if you know you will need more. If you run out, email me at themindfulbus@gmail.com and I will send you the image so you can print out more. As a therapist, how can I use this game in individual therapy if I don’t want to disclose anything about myself? There are two ways you could use it in a one-on-one session if you don’t want to disclose anything. 1. Guide the client through the game as they play by themselves. 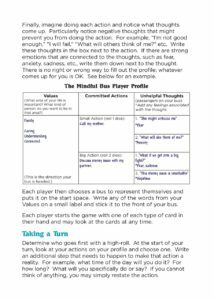 Guide them through filling out the player profile, prompt them to add a detail/step to an action before rolling, and you get to hold the cards and choose which card to read to them as they land on thought squares. 2. Have the client fill out 2 player profiles, one for one value, and the other for another value. Use two buses and you play as one of the buses and use one of the profiles. You can ask the client what detail they want to add to the actions before rolling. Then just play as usual, trading off reading cards for each other as you land on thought spaces. What is meant by “out of the swamp” in the Quick Start Instructions? The swamp is all the spaces before the first “Self Care!” square. For the quick start instructions, once you are out of the swamp (past the first “Self Care!” square) your bus is moving faster, so you roll 2 dice. Essentially, the swamp makes your bus move slower so you only roll 1 dice to determine how many spaces you move when your bus is in the swamp and 2 dice when you make it out of the swamp.